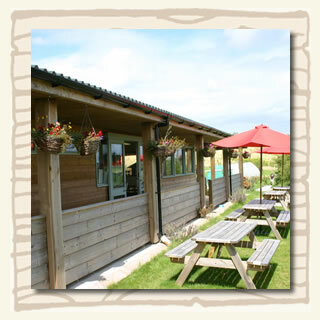 Our cafe is a great place to enjoy a drink and a bite to eat whilst you take in beautiful views of the South Devon countryside. You can sit inside or out - we have an undercover outdoor area too for when the weather is in-between! Well-behaved dogs on leads are welcome in our outside areas and in our cafe. We are on a 10-acre site with plenty of room to ramble, including an orchard and a viewpoint walk. Click on the menu image to see a sample menu. Dishes and prices may vary and we also have a Specials board. Breakfasts are served from 10 until 12. Light bites and lunches are served from 12 until 3. Cakes and cream teas are served from 10 until 4. 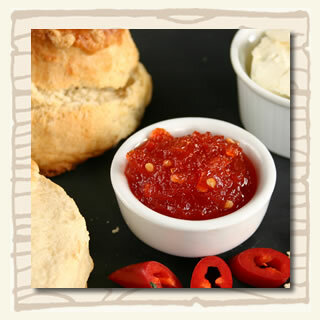 The menu in the cafe caters for all tastes and the traditional cream tea sits happily alongside a savoury cream tea, using our own Chilli Jam. 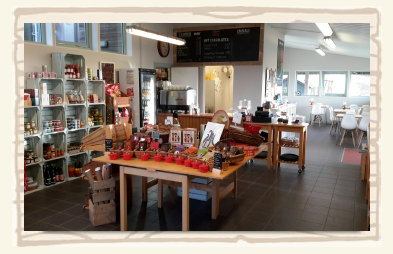 Many of our dishes include our own chillies and chilli preserves, grown and cooked on-site at the farm. Most of our ingredients are sourced from West Country suppliers. 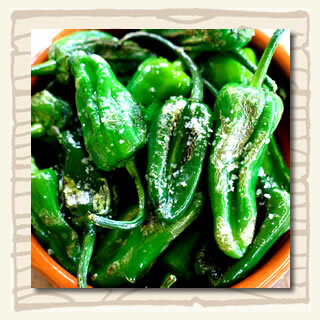 From early Summer to late Autumn you will usually find the delicious Spanish tapas dish of Pimientos de Padron on the menu, with chillies picked fresh from the farm. This dish is often referred to as Russian Roulette, as mostly the chillies are heatless or very mild but you get the odd one that is super hot! During the summer months we incorporate more of our own fresh chillies on the specials menu, such as Hot Wax and Cherry Bombs! Some Like it Hot! Some Like it Not! We aim to satisfy all tastes, whether you like it Hot or Not! You can help yourself to a selection of our hot sauces to achieve your desired level of heat. Speciality coffees: espresso, cappuccino, latte, flat white, mocha, americano. We serve a delicious Origin Colombian/Brazilian blend of coffee which has been perfectly roasted for a smooth, rich flavour. 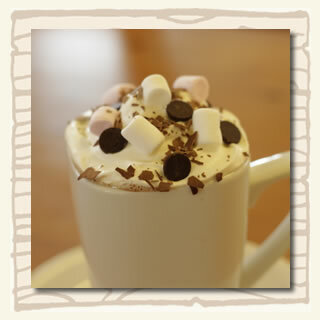 Hot Chocolate, including our Award-winning house special: Chilli Hot Chocolate - try the luxury version with cream, marshmallows and chocolate buttons. Juices: local juices and fizzes, including some from our neighbours down the road at Heron Valley. Alcoholic: West Country ciders and Local beer! Unfortunately we cannot take bookings during busy times such as school holidays and bank holidays. Booking is not usually required in our cafe although occasionally, you may have a little wait for a table during the holiday periods. If you have a large group, it is a good idea to call in advance and we may be able to reserve a table. During certain times of the year, we offer guided tours of the farm. The format and content of the tour is determined by the season. See the "Tours" section of our website and please phone for more information, availability and booking of large group tours. We have colouring and quiz sheets for children, as well as a dressing up bag and an outdoor Play Area. Check out our Newsletter for special children's activities at Easter and Halloween! Please Note: Dogs are not allowed in the Farm Shop but are welcome in the outside areas, including the Plant Nursery, Show Tunnel and undercover eating area. Well-behaved dogs on leads are also allowed in the cafe. "We loved this place and over a fortnight visited four times after finding it last year we weren't going to miss it this year. The staff are always pleasant and helpful, the food is superb.I would go so fair as to say one of the best cream teas in Devon." "Only called here for coffee one Saturday morning as I had a meeting nearby. Lovely setting and a nice clean dining area. Good coffee and the staff were very pleasant. I will try and call again!"